Mercedes-Benz has made a ute: the X250d. But why? Is it just a Navara in a posh coat? Eight years ago, BMW announced it was building a ute based on its legendary performance car, the M3. This was an April Fool’s Day prank. “Under the strictest secrecy, the world’s first high-performance pickup has been created at the BMW M GmbH development centre,” they chortled. “This unique vehicle has already completed extensive test and set-up drives on the Nurburgring’s Nordschleife in advance of its global unveiling on 1 April 2011.” Ha. Germans. That famous Teutonic sense of humour gets you every time. Except… except that BMW actually, genuinely went and built one, proving that Germany is either very, very committed to the joke, or — more likely — that they have a fundamental misunderstanding of what jokes are. BMW’s pickup wasn’t, as the company had claimed, “the sportiest example by far in this vehicle category” — with an uncharacteristic lack of precision, it entirely missed the existence of Holden’s ute-lovin’ HSV performance division. But the Bavarians’ M3 frankenute did actually exist, albeit as a one-off, standalone model. It had the bones of a good April Fool’s gag, and an even better PR coup, because prestige German car brands simply don’t ‘do’ utes. Or, at least, they didn’t in 2011. Even today, if BMW or Audi announced a pickup, it’d sound sillier than a lederhosen full of sauerkraut. But Mercedes is different. The world’s oldest, and best-selling, most enduring luxury automaker may have a pedigree second to none, but the brand with the three-pointed star also has a booming stable of commercial trade vehicles. It has always produced the slick and classy at the same time as the blue collar: working vans like the Vito and the Sprinter, oddball, ugly farm vehicles like the Unimog, and everything from light- to heavy-duty trucks. Mercedes is Jekyll and Hyde at once, if Jekyll was a thrusting corporate titan, and Hyde was a white-van man with pie crumbs on his King Gees. 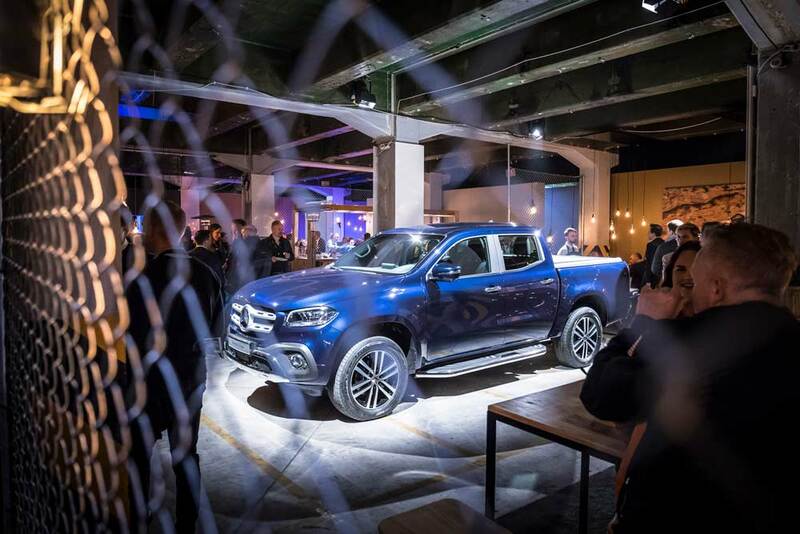 All of which gives the X-Class the perfect pedigree to create a prestige luxury ute. Even so, the top end of our domestic market — which Mercedes seeks to immediately gazump — is already a competitive field. Toyota’s HiLux is Australia’s best-selling car, Ford’s Ranger is outstanding, and VW’s delightfully specc-ed Amarok is already as slick as it is tough. They’re pricey, too. HiLux and Ranger easily breast the $60,000 mark at top spec; the most luxurious Amarok, with an even more polished interior, and a few extra kilowatts, unapologetically nudges $80,000. The X-Class is a vehicle that only Mercedes could build, but it isn’t entirely a Stuttgart creation. It’s based on Nissan’s Navara, its bones pilfered from the Spanish factory floor of its Japanese alliance partner. Mercedes made changes along the way, and they’re not simply cosmetic. An already durable ladder-frame chassis has been strengthened, and replaced both axles. The X-Class is a pinch wider than the donor Navara, with suspension that anchors differently to its frame. The Navara’s rear drum brakes simply wouldn’t do for Mercedes on its new tradie flagship, so they were traded for discs. Nor would the juddering, leaf spring suspension, customary in so many rivals, although handily for the Germans, their old Japanese Axis allies already kit out the Navara with more mannered coil springs at the back end. So far, so good. But utes, perhaps as much as any performance car, demand solid numbers. Pop the X-Class’s hood and you’ll discover two engine options at launch. Both are four-cylinder 2.3L jobs, and both are also pinched from Nissan, albeit with an engineering tickle that doesn’t actually pump its output figures. Base spec is a single-turbo engine with 120kW and 403Nm, with a step-up twin-turbo option that’s good for 140kw/450Nm. When a third variant, a Mercedes-sourced 3.0L turbo-diesel V6, arrives a few months down the track, its 190kW/550Nm output will make it the most powerful in class. Perhaps unsurprisingly, it’s style-wise where Merc has worked Nissan’s clay the hardest. There’s nothing wrong with a prestige marque requisitioning and/or sharing parts with less premium stablemates. The Volkswagen Group, for example, uses its A series platform for everything from the Audi TT to the VW Tiguan to the Škoda Octavia and Spain’s SEAT Toledo. It’s a new level of polish that’s Mercedes’ real pickup selling point. Once upon a time, ute buyers weren’t given the option of even rudimentary bling. The thinking was simple and, in retrospect, very stupid: that tradies — or, at least, those not driving car-based utes — couldn’t be bothered with all those extras. Wrong. When the penny finally dropped, work utes got flasher, seemingly overnight. The X-Class’s promise is to step this up again, and it mostly delivers. It’s a refined ride, with good insulation from road and most wind noise, and Merc’s circular air vents emerging elegantly from a sculpted dash. The steering wheel is a cut above rivals’ offerings, and an 8.4-inch MMi screen hovers primly in the centre. There are a couple of disappointments, including no telescopic steering wheel adjustment and more hard, agricultural plastic about the cabin than you’d expect. If it’s to add durability, it makes sense, but it jars with the fine choices of dash trim (matte black, woodgrain, aluminium) and half-dozen seat options, including two in leather. And speaking of options, there’s no radar cruise control or Apple CarPlay/Android Auto. Overall it’s resolved and decisive, but will disappoint those hoping for a C-Class on stilts. Will that matter? Maybe a little. Mercedes knows the strength of its badge. And that larger, forthcoming engine will do a better job of hauling its considerable 2.3 tonnes about — although it has respectable shove already, with the twin-turbo reaching 100km/h in a not too bad 11.8 seconds. It’s a solid proposition that has an obvious niche: the super cashed-up tradie. Utes are big business in Australia, although in the world’s largest market, the US, the X-Class will look comparably tiny among the Yanks’ hulking coterie of Chevy Silverados, GMC Sierras and Ford F250s. But Mercedes rarely does anything so dramatic as enter an entirely new category without a solid business case. So whether or not the German sense of humour catches on, the X-Class will be here to stay.